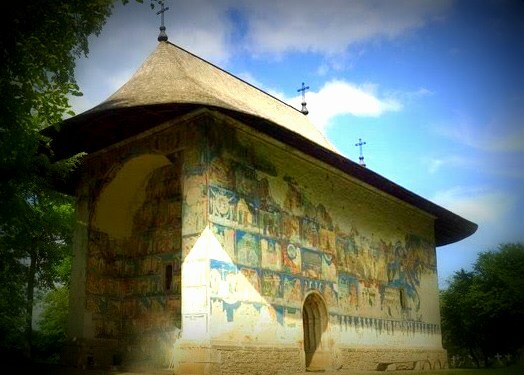 Arbore Monastery is located about 30 kilometers from the city of Suceava, Romania. The building was built in the beginning of the 16th century by a man called Luca Arbore, who was a gatekeeper of Suceava during the reign of Stefan cel Mare. Arbore has defended the fortress during Polish attacks in 1497 and later right near his residence he built this monastery which for the purpose to use it as a cemetery and family chapel. Before the painting of the monastery was completed Arbore and his sons were beheaded because they were accused of treachery, thus he never saw the building in its complete glory. The paintings are remarkable frescos painted with five shades of green background as a predominant color. The paintings contain 47 shades of colors combined with ochre, pink, red, yellow and blue. The method of blending those colors into specific shades is now lost as the painters have not shared the secret but scientist have identified about thirty substances in them such as vinegar, honey, egg, animal size and gall. The paintings inside were severely damaged during the 17th and 18th century and the church remained roofless. 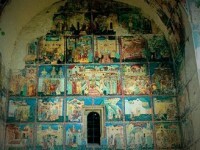 Restorers can only stabilize the frescos left intact. The team of painters was lead by an artist and genious from Iasi called Dragos Coman who was famous for innovation and new visions. He usually combined western and oriental elements with traditional ones. The vivid and delicate paintings mostly are representations of scenes from the lives of the Saints and from Genesis. Among these masterpieces we can mention the story of The Prodigal Son, The Last Judgment and the Seige of Constantinopole. 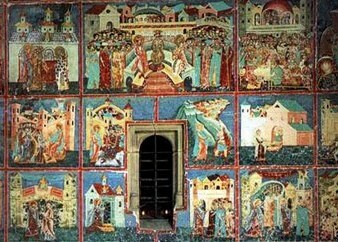 On the western side there are miniatures, painted scenes from the Life of the Virgin and stories of Moses while the southern wall contains scenes which depict some episodes from the Lives of the Saints. The mentioned monastery is enlisted as a UNESCO monument which has been restored during the first half of the 20th century. Inside the building there is an ethnographic museum displaying valuable assets of the surrounding region. If you visit Arbore Monastery you can also visit the burial chamber where Luca Arbore and his Polish wife are buried. The burial chamber is decorated with Gothic elements with Polish influence. Visit Suceava and take a quick trip to see one of the most beautiful churches of Romania: Arbore Monastery.